Every so often when you are out hiking you are presented with a situation where you wish your equipment would perform just that tiny bit differently than it does; but no matter how you adjust it it doesn’t quite get there. In my case it was when I was out hiking and the torrential rain and heavy winds set in – I found the rain would often drive into my face and as a result, I wasn’t paying enough attention to my surroundings. 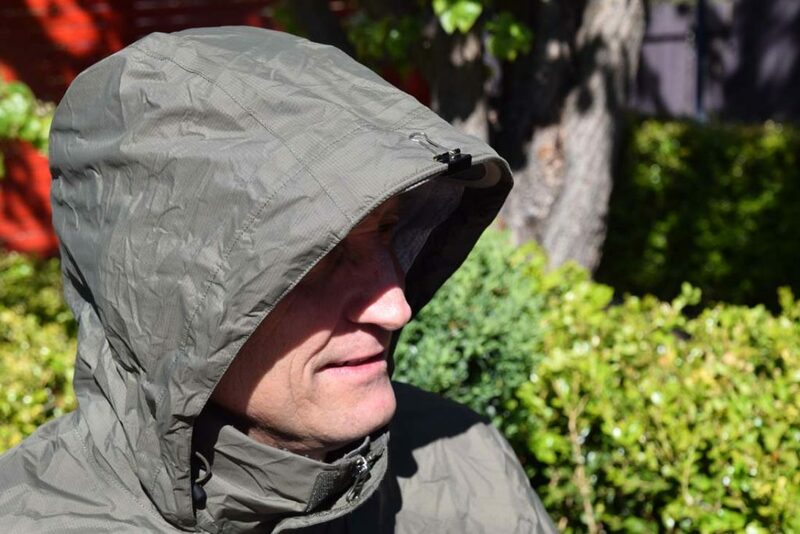 Stage two saw me wearing my peaked cap under my rain hood which I did for a few years and this made a big difference but I still found the peak would get wet if the rain was heavy enough and the water would wick into the rest of the cap. I started to think ‘if only there was a way I could get the peak of the rain jacket over the peak of the cap’. 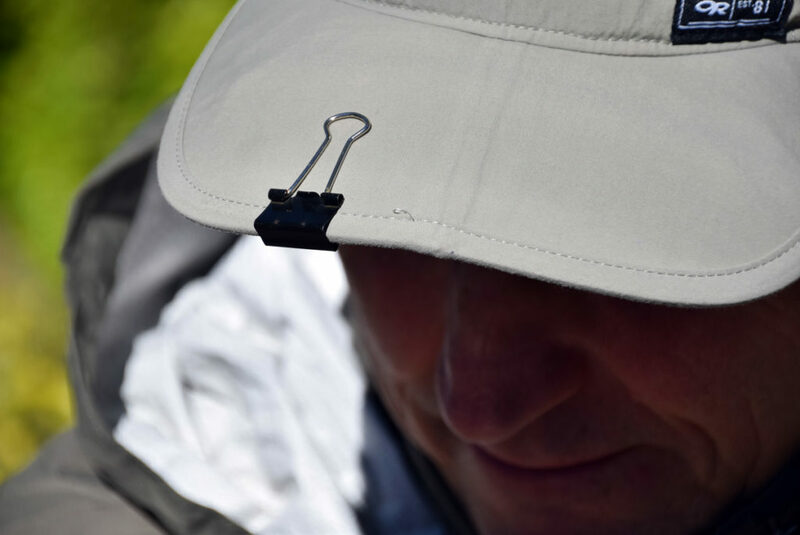 So I decided to try using a fold back clip (19 mm) to hold the peak of my rain jacket to the edge of my cap. After a few short try outs I decided what better way to test this out than on a five week long hike where I only had eight days without rain. As weird as it looks this 2 gram clip which costs around 90 cents worked a treat. It turns the jacket hood into a ‘porch’ and even on those days I had heavy rains and strong winds, I stayed relatively dry. The best 90 cents I’ve ever spent on a piece of hiking gear! 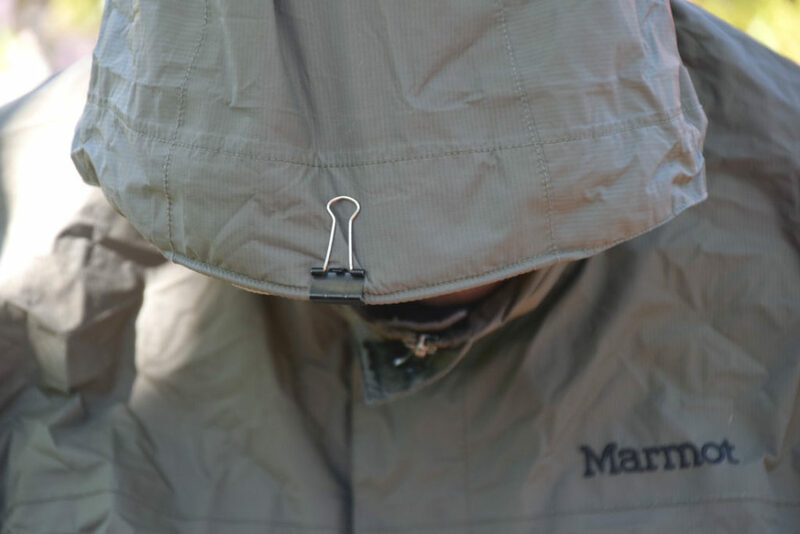 This hack may not work with every rain jacket hood but it’s worth giving it a try.